Railpictures.ca - Michael Berry Photo: A CN transfer is entering the Port of Montreal light power with CN 4115 & CN 9677 for power to pick up some cars. The train is crossing the eastern end of the Lachine Canal. | Railpictures.ca – Canadian Railway Photography – photographie ferroviaire Canadienne. 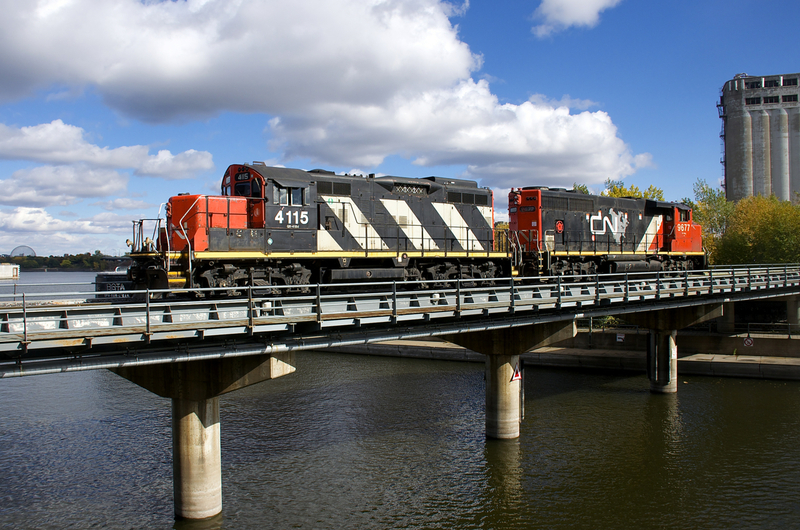 Caption: A CN transfer is entering the Port of Montreal light power with CN 4115 & CN 9677 for power to pick up some cars. The train is crossing the eastern end of the Lachine Canal.